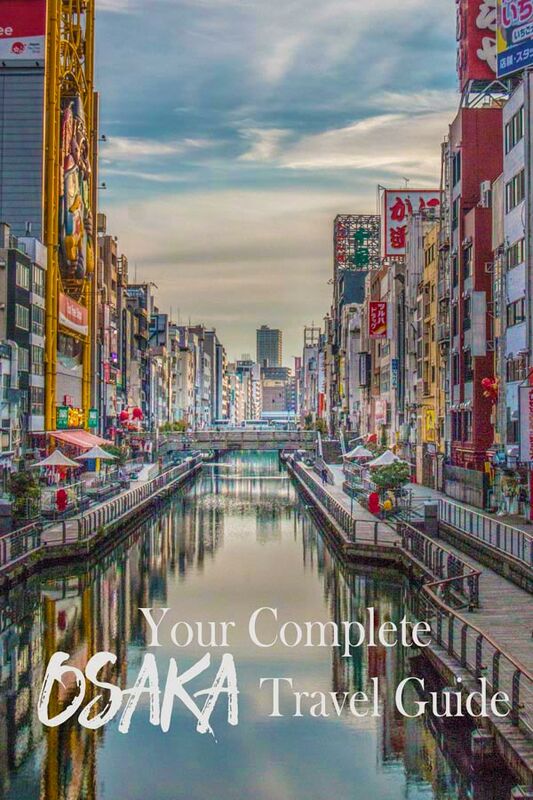 An Osaka travel guide that answers all your questions as a first time visitor. How to get to the city, the diversity of things to do in Osaka plus where to eat, play and stay. We’ll share the most popular places that should not be missed alongside some personal favourites you might not find in the guidebooks. Osaka is Japans third largest city. It’s modern, vibrant and has a lot to offer the visitor. 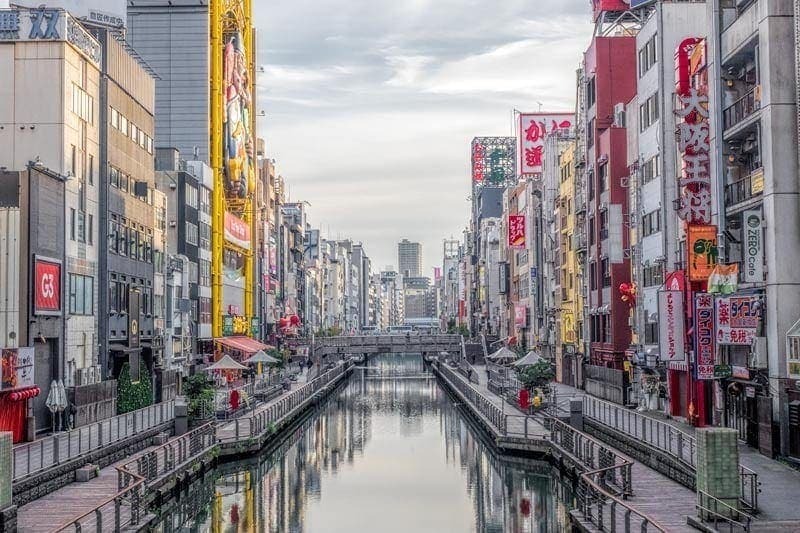 The vibe and culture of Tokyo and Osaka are very different, even if you’ve already spent time in Tokyo you’ll find Osaka well worth a visit and spending some time in. Osaka is also a great base for exploring the wider Kansai region. Osaka has been known as Japan’s kitchen since the Edo period making it a must for the travelling foodie. It also has some great gardens and natural places, interesting history, culture, festivals and attractions. In this article, we’ll cover all you need to know about planning your visit based on multiple trips to the city over the years. If you have a question we haven’t addressed please ask in the comments section at the bottom or send us a message through the contact page, we’d be happy to help. This popular destination in Namba runs along the Dotonbori canal between the Nipponbashi and Dotonboribashi bridges. The main activity in Dotonbori is EATING. You’ll find everything from Michelin-starred restaurants to cheap but delicious street food. It’s fun to wander around at any time of day but especially at night when the neon lights are beaming bright and reflected on the water. Make sure to watch out for the Glico running man, this neon sign has been lighting up the site since 1935 although it’s had a few overhauls and updates to reflect sporting events and teams in Japan over the years. It’s among the most photographed icons in Osaka. A visit to Osaka Castle can leave you feeling as if you’ve stepped back in time to feudal Japan. Although it’s not one of the few remaining original castles having been lost during WWII, it’s a dramatic part of the city landscape. Inside the castle is a museum and if you make your way to the top the view is quite good from here. The park and gardens retained around the castle are extensive and it gives you a feel for the way the feudal leaders were able to look out on their territories even from a flatland castle. You’ll find more tips on what to see and do when visiting Osaka Castle in this post. Something we love to do when we head to a new destination is find the high point and get a perspective from above. It’s usually quite spectacular and helps us in the days that follow to understanding the layout of the area a little better. 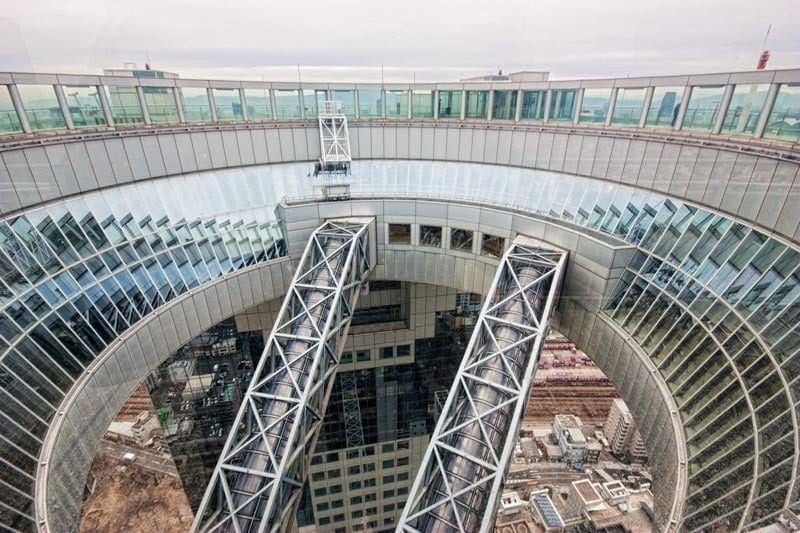 In Osaka not only will you get incredible views from the Umeda Sky Building of the surrounding city, suburbs and rivers but the building itself is a work of art. We had the Osaka Amazing Pass on our first visit to the city so headed up the massive escalators of the Umeda Sky Building in the late afternoon for daytime views then settled into the bar for a drink so we could watch the daylight fade and the city light up for the evening. Osaka city is massive and from up here you truly get an appreciation for that. Also included in the Osaka Amazing Pass is the Aqualiner cruise on the river although of course you book the river trip independently. 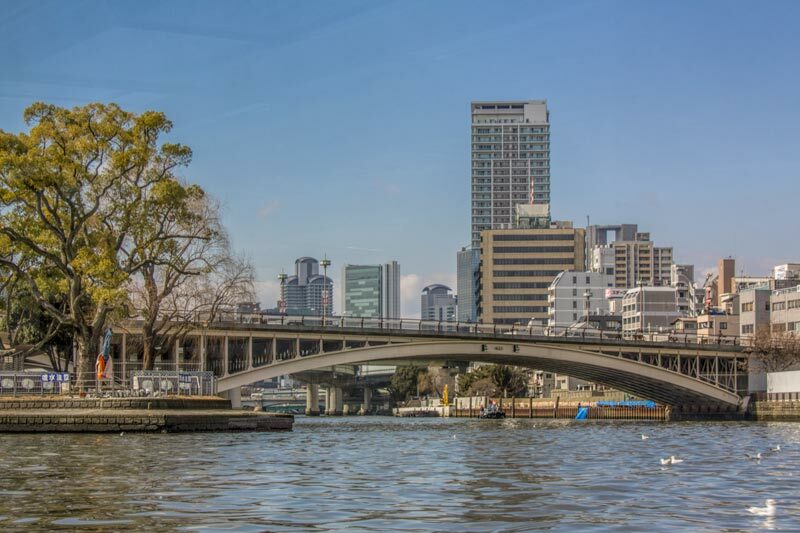 The tour takes around an hour through the river ways of Osaka pssing by points of interest such as Osaka Castle and Nakanoshima. The perspective of the city from the water adds another dimension to your experience of Osaka. The Aqualiner you travel in is quite unique, it’s futuristic looking and sits low in the water but during the trip in order to pass under some of the low bridges of the city you will be asked to stay in your seat while the roof is hydrolically lowered even further so you can glide underneath. 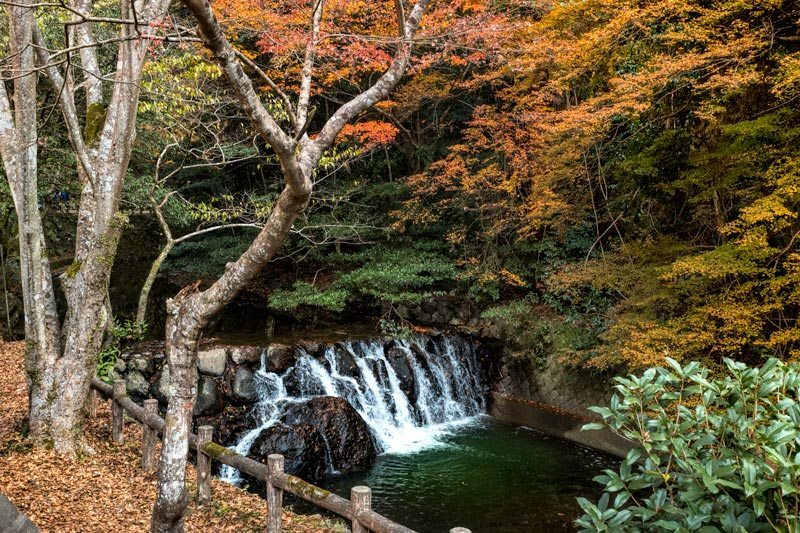 An easy day trip from the city is Minoo Falls and park. While beautiful in all seasons it is possibly Osaka’s top spot for the autumn colour. It’s an easy walk on paved paths although you are going substantially uphill on gentle gradient. In addition to the natural beauty along the way you’ll pass traditional shopping streets, ryokan, a free foot spa to revive tired feet on the way home, a Shinto Shrine and Buddhist temple. At the end of the trail you’ll come to the dramatic Minoo Falls although on the day we went we were stopped short of the final destination as the track had been closed for repair following damage by a typhoon so we had to settle for smaller falls like these along the way, still very pretty and a highly recommended way to spend the day. Osaka city doesn’t have the visible history of nearby cities such as Kyoto or Nara having suffered heavy bombing during WWII that resulted in much of it being rebuilt after 1945. So it’s worth making a small detour for gems like Hozenji temple and Yokocho. This small temple is tucked away at the intersection of narrow laneways in the middle of Namba that you may not find unless you know it’s there or like us you are regularly diverted by food. The yokocho is a narrow stone paved lane lined with traditional izakaya style restauants that you simply must try. 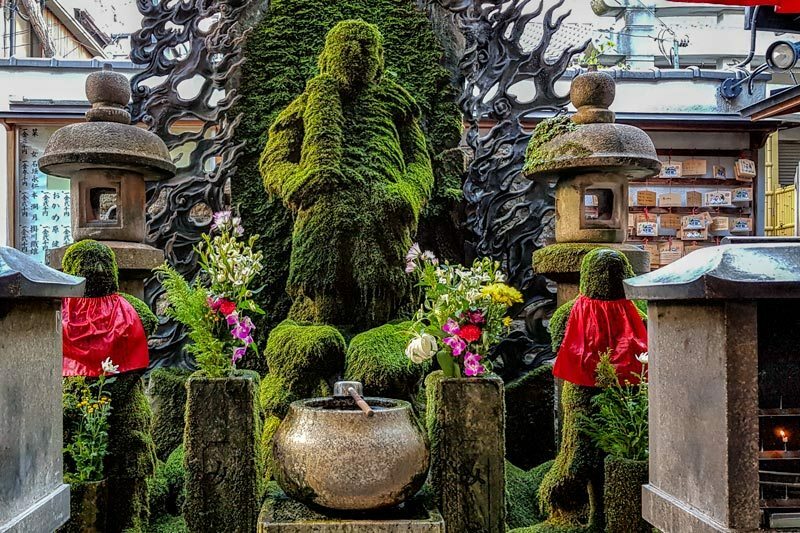 The small temple was established in 1637 and is known for it’s Fudo statue completely covered in moss. Fudo is a guardian, one of the 5 wisdom kings in Buddhism and this statue was the only thing to survive the extensive bombing in the area. Seen as a positive omen the rest of the temple and yokocho were soon rebuilt around it. It’s unusual to see something covered in moss like this in the middle of a city but it also makes it quite special. It’s normal practice at a shrine in Japan to toss a coin into an offering box before prayer. At this shrine it is thought initially those who had no offering would instead ladle water over the statue, similar to the tradition of bathing buddha, over time that became the norm and as a result the constantly wet statue in the shade of the city was softened by a lush mossy covering. Another short trip from the centre of the city will take you to the suburb of Sakai. This area has preserved ancient history of Japan dating back to the 5th century when people built vast symmetrical keyhole shaped burial mounds. These tombs while much shorter than the great pyramids of Egypt are greater in volume and show the same, organisation, respect and impressive engineering feats for the time. There are kofun found in other areas of Japan including Tokyo and Okayama but those at Sakai are the largest, in the greatest number and therefore most historically significant. While in Sakai make a visit to the municiapal office, the public area offers great views of the city and is the best way to see the scale of these kofun from above. I really enjoyed the walk from the station through the residential neighbourhoods to the kofun and Daisen Park but perhaps my favourite attraction in Sakai are these traditional Japanese gardens and teahouse overlooking the lake. While not on any official ‘best 3″ list I know of these are very high on our top gardens in Japan list and we’ve been to a lot now, highly recommend them if you are in Osaka, especially for the autumn colours. One of the best ways to get to know a city is through its food, that’s especially true when the city is known as Japans kitchen. A great place to start is at Kuromon Ichiba Market in Namba. This market supplies both the commercial restuarant trade and the Mums and Grandmas of Osaka, it’s also now a popular place for tourists to visit so I’d suggest getting there early after it opens at 9am. Fish traders have operated in the area since the early 19th century but the market wasn’t established until 1902, today it’s till known for the variety and quality of its seafood but its 200+ stores offer far more variety. Something we loved about this market is that it is so well set up to purchase and eat as you wander around and the places offer many sample sized options so you don’t need to eat a full meal in one place. 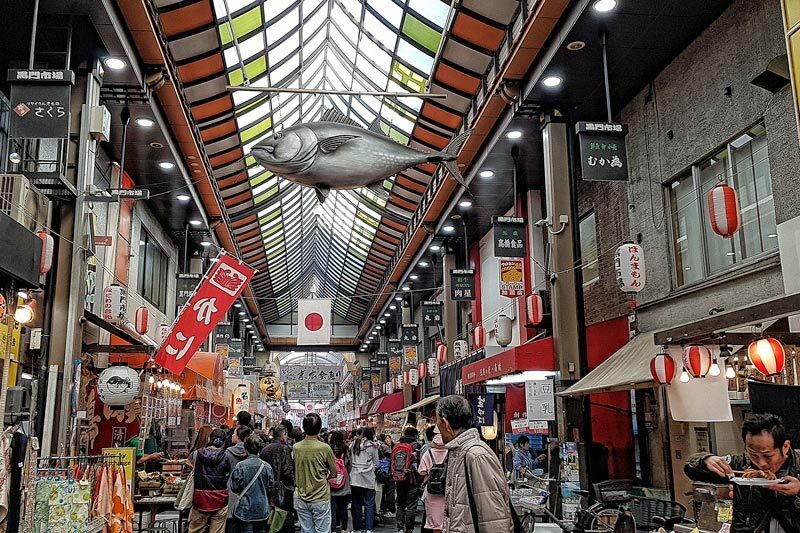 This post will shown you why Kuromon market is an absolute must on your itinerary. 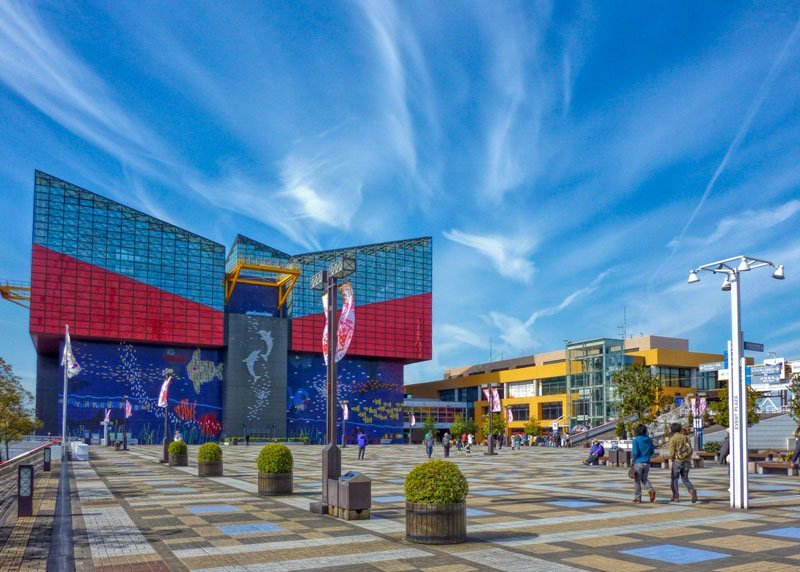 Head out to the Osaka Bay area to find the aquarium. The entirely indoor facility is a great option if you strike some wet weather. It includes 15 large aquarium tanks including the massive central tank. We enjoyed the theming of this aquarium with each tank represent one region from around the Pacific Rim, we found some of the less popular exhibits including the puffer fish, giant Japanese spider crabs and all sorts of jellyfish among the most interesting. While out here you will also find the departure point for the harbour cruise ship Santa Maria, the Temporan giant ferris wheel and Legoland. These activities are all included in the Osaka Amazing Pass, we discuss the value of the pass and our sample itinerary. They call Osaka ‘Japans Kitchen’ for good reason, there is great food to be found here at all price points but then we find that to be the case everywhere we’ve travelled in Japan and each city or region has its claim to fame in the food space. Eating crab is extremely popular in Japan, especially in autumn and winter when the catch is in season. Although I associate the freshest crab with Hokkaido’s icy cold water, the crab restaurants seem even more popular here. 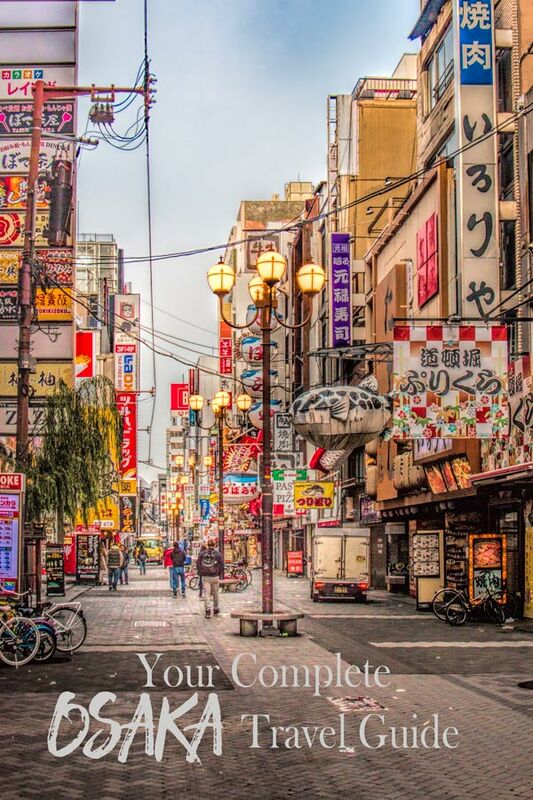 You’ll find an astounding selection of restaurants specialising in the crustacean, among them is Konidoraku Honten Osaka one of they citys most iconic restaurants. If you’ve spent more than an hour in the city you are bound to have noticed this place in Dotonbori, that giant mechanical crab is real give away but contrary to appearances perhaps the crab is fresh and it gets excellent reviews. A good meal of crab can be quite expensive, so you want to look around and choose your restaurant. Many offer set menus comprising a variety of small dishes to taste the crab in different ways, both hot and cold. You may also notice that many serve a very similar menu at lunch time but for a significantly lower price than in the evening, this is a good option if you want to stretch your budget. Translating to something like ‘grilled as you like it’ is a reasonable description. These delicious creations can no be found all over Japan with local twists but the best in my view will always be Osaka style. They are a mix of finely sliced cabbage, a batter that looks similar to what you’d use to make pancakes and some magic with toppings and inclusions of your choice. The magic is that they taste nothing like a pancake or cabbage for that matter. I can’t begin to list the places we’ve eaten these, everywhere from yatai carts at festivals to some fairly fancy modern bars. My pick from our recent trip was a specialty place along the historic Hozenji Yokocho. Street food isn’t a common thing in Japan generally, it’s really not done to stand or walk around while you eat and yet Osaka is the home of Takoyaki, something I would class as the perfect snack food. Don’t be put off by the english reference to octopus balls, takoyaki are small dumplings with a piece of octopus (tako) in the centre of a soft batter ball that’s been fried while being flipped inside a half circle grill plate to form a perfectly symmetrical little sphere. They are then topped with mayonnaise and shavings of bonito. If you’re as addicted to this tasty treat as much as I am you can pretty much do a Takoyaki crawl of the city to find the best of the best. Some like Aizuya snagged a mention in a Mitchelin guide publication but that’s no guarantee it’ll be your favourite, there’s a ton of variety now not only in whether the octopus should be chewy or tender, the batter goey or firm, the outside just sealed or crispy and of course new fillings and toppings are popping up on menu’s everywhere. A bit like my gyoza I’m a traditionalist by preference but that won’t stop my trying the variants. I always have room for takoyaki. I’ve mentioned the Kuromon Ichiba above in things to do in Osaka but do make this a progressive meal, or at least go when you are hungry and can try some of the wonderful fresh offerings. I converted Drew to eating unagi here, it’s something I love and was beautifully prepared and the crab mornay in shell was pretty special too. If you want a more ‘hand’s on experience try the giant crab leg, provided with nut cracker and pick to get out all that sweet delicious crab meat. Kushiage are small skewers (kushi) of battered and fried vegetables and meats that are really popular in Osaka. The Shinsekai area around Tsutenakaku tower is especially known for these restaurants. Kushi aren’t a traditional food, it’s thought to have started at Daruma in 1929 and became popular after the war as a cheap, tasty and filling meal for the masses. Kushikatsu are usually served with a large communal bowl of a tonkatsu style sauce and a plate of pieces of cabbage. Whatever you do, don’t double dip into the sauce! The cabbage has a dual purpose, it helps digestion when eaten with fried food preventing it becoming heavy in the stomach but you can also use a piece as a ladle to take a little more sauce to pour onto your kushikatsu once you have taken a bite. Osaka is well situated as a base for travelling around the Kansai area and beyond. There are many suitable day trips from Osaka that we’d recommend if you have a spare day or two, there’s something on this list to suit all styles of traveller and interests. Some of these options involve some longer train travel than others but they’re are all suitable to do as a day trip, the longer distance trips (using JR limited express and shinkansen trains) can be especially good value options if you’re using the Japan Rail Pass. There is so much to love about Nara. This city was the first permanent capital of Japan from 710 with many historic temples and treasures dating back to the 8th century. It’s the tame deer wandering throughout the town though that stole our heats and make it so unique. Read more about why we love Nara. Osaka is the best base to access Koyasan from, either for a day trip or an overnight stay. Koya-san or Mount Koya is a mountain in Wakayama prefecture, a secluded temple complex of over 100 individual temples. The best way to get there is on the Nankai private railway from Namba, there’s a cable car up the mountain and buses available at the top to get around. Is a port city only 30 minutes by train from Osaka. Kobe was heavily damaged by the Great Hanshin earthquake in 1995 so much of it was rebuilt since then although there is a preserved section in the wharf area that gives you an idea of just have substantial the damage was. Kobe is one of the 3 major Chinatowns in Japan which is well worth a visit and take a ride up Mt Rokko for the great view either by day or night. For the foodies there’s many option to try the famed Kobe beef and in the Nada district, a traditional sake area, there are several breweries and museums offering tastings. The castle town of Himeji castle is a 35 minute train trip from Osaka. This is arguably the top original castle in Japan, it’s had extensive renovations completed on it in the past few years ensuring it withstands many more years. It’s design is undeniably impressive, it’s gardens beautiful and there is a significant amount of it that has been preserved. With such an easy trip from Osaka to Himeji I highly recommend seeing it, especially if your visit happens to co-incide with the sakura blossom, it really is quite magical. Read more about planning a visit to Himeji. For more ideas and detailed information you might also enjoy our article on day trips from Kyoto, all of these are also suitable to take from Osaka. As a modern metropolitan city, Osaka can be enjoyed all year around. 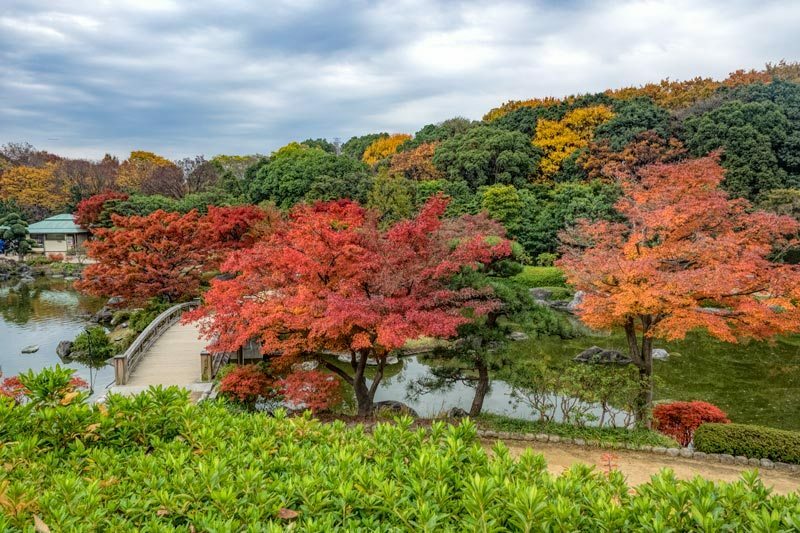 Like much of Japan we particularly enjoy natures seasons here, both the ume (plum blossom) and sakura (cherry blossom) at Osaka Castle and city parks are stunning and we’ve recently had to question whether the jewel tones of autumn leaves are even better. Winter temperatures are usually in the single digits (celcius) but rarely fall below zero. Winter offers the opportunity to wrap up warm, enjoy the winter lightup events and some great specialty seasonal dishes and as it progresses the ume (plum blossom) will start to appear. January is the coldest month with average temperatures around 6°C. Spring brings the cherry blossom and many seasonal celebrations. The temperature varies widely with averages around 15°C. Summer is hot in Japan and the season of typhoons. August is the hottest month of the year with an average temperature of 29°C. While modern shopping centres, international hotels and some restaurants usually have airconditioning it’s not as common as it is in the west which can make the heat more difficult to deal with for many tourists. But summer is festival time and the season of fireworks. Osaka’s temperate climate and proliferation of deciduous trees means autumn is a riot of natural colour from the structural gingko trees planted through the city streets to the diversity of the many parks and gardens. Temperatures average around a comfortable 20°C during autumn. Most visitors arrive in Osaka either through Kansai Airport or by bullet train into Shin-Osaka from other parts of the country. We’ve flown in and out of Osaka on several trips including our most recent trip with Jetstar Australia. One of the reasons we’ve chosen to fly with Jetstar on most of our Japan trips is that from Queensland we can fly direct to either Osaka (Kansai) or Tokyo (Narita). They also offer a multi-city option meaning you can fly into one airport and out of the other while still making use of their online booking deals. As we found on our autumn trip this can be a saving in both time and money as you’re not back-tracking across the country. We’ve used both the domestic and international sections of Kansai Airport, interestingly the best food options here are in the domestic area but the two are co-located so it’s not difficult to head over there before you go through security if you’re flying internationally. As we often fly home on a night flight we’ll grab dinner here and I’m pretty much ready to watch half a movie and sleep by the time I get on the plane. The Shinkansen is the other popular method for tourists to arrive in Osaka. The train from Tokyo takes around 3 hours to shin-Osaka and from here you will need to transfer into the city itself, you can do this by train, taxi or subway. On most of our Japan trips we purchase the Japan Rail Pass which can be a cost-effective option if you plan on doing some long distance trips from or between the major cities. As shin-Osaka is on the busy Tokaido-Sanyo route from Tokyo to Hiroshima we’ve used and passed through this station many times. There are two main areas for tourists to stay at in Osaka City, either Namba or around Osaka station. There are different options on getting to the city depending on which your hotel is close to. the Airport limousine bus has transfers to JR Namba which takes 65 minutes and cost Y1050. We were arriving in the evening and because Namba station was closer than JR Namba, a faster trip by train and more frequent departure we went with the Nankai Rapi:t option. the Airport Limousine bus taking about 90 minutes and costing Y1550. We’ve stayed near here previously in the Hilton Osaka which is adjacent to the station. It’s convenient for catching the Airport Rapid back to the airport and getting around using the Osaka Amazing Pass on that visit. To check the latest ticket price and scheduling for transport in Japan we use Hyperdia, it’s free, accurate and covers multiple train lines and public transport options. Even on my phone while travelling I prefer to use the browser-based version of the site over the app, I find it less buggy and it’s still very easy to use on the small screen. We’ve never used a bus in Osaka but the subway and trains on the Japan Rail, Nankai and Keihan networks have all been super useful at different times for getting around in Osaka and through to neighbouring cities. If you’re travelling independently in Osaka or more generally in Japan for more than a few weeks I’d highly recommend picking up a stored value card such as the PASMO, ICOCA or SUICA. They are issued by different train companies but now they are pretty much interchangeable and can be used on most public transport across the country. They don’t save you money as such but they are really convenient and will save you time. A ticket we have discussed on here before is the Osaka Amazing Pass, it’s a city pass that we have found offers good value as it includes transport for the pass period in addition to free entry at key Osaka attractions and discounts at others. Read more on how we’ve used the Osaka Amazing Pass to get value on our trips and check the current price options here. Many people have heard about the JR Pass and the great value it offers, it’s true it can save you a lot if you are travelling back and forth between Tokyo and Osaka in the 7 day period or taking other longer distance day trips. If you’re looking for ideas for day trips out of Osaka you’ll find a selection in the linked article that are all great options. 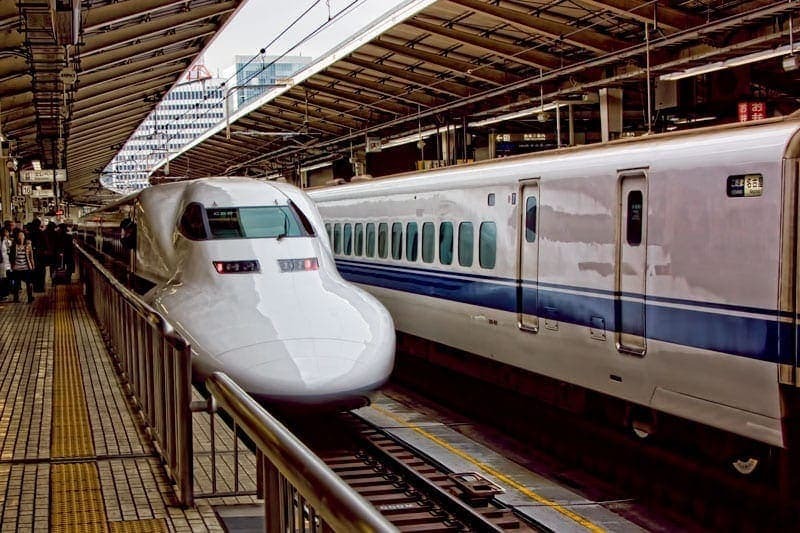 While we have purchased the JR Pass on MOST of our trips to Japan we don’t buy it every time, find out when the Japan Rail pass is great value and when it isn’t too! As mentioned in the transport section there are two main areas of the city that people will stay in Osaka when travelling for pleasure rather than business. Having now stayed in a couple our first pick would be Namba in future, its the dining and entertainment hub of Osaka and staying here you will have plenty of options to eat at all price points even if returning late to your accommodation. It’s also very easy to access by public transport both as you go about your days exploring and for the airport and connections on to other cities in Japan via train. We’ve stayed at and would recommend the Namba Oriental Hotel. It’s conveniently located in an arcade directly across from Namba station. Despite having literally hundreds of options to eat at all hours of the day and night surrounding it, it was quiet, comfortable and offered great value for money. It’s a short walk from here to Dontonburi, Kuromon market and a variety of shopping options. I’ll link a detailed review with photos here soon. If you prefer to stay near Osaka station for convenient access from other nearby cities, we suggest the Hilton Osaka it’s just across the road. We’ve also stayed here and found it convenient both arriving from Kyoto and leaving via Kansai International Airport. The subway operates from the same station making it easy to explore all parts of the city plus you’re a close walk to the Umeda Sky Building for incredible city views. It’s an upscale international hotel that offered comfortable, well-appointed rooms and great service. Osaka is a must visit city in Japan. Even if like us you’re not a big city dweller at heart the food, culture and diversity will draw you in. What a fabulous site to find. Congratulations on the useful information on Japan. Do you know if the Aqua Liner water bus in Osaka is wheel chair accessible? Hi Sylvia, I normally try to note accessibility but I’m not certain on this one. From my recollection I’d say no as there was a step up to the pier where we disembarked due to how low it sits in the water and the entry point was quite narrow. I’m sorry I can’t be more help. This is such a timely post for me to look at. We just confirmed our fall trip and we will be going to Japan. Unfortunately, we only have one night and another full day in Osaka. I love canal towns (visited Copenhagen and Amsterdam last year). Heading to a high spot is also something we like to do when we visit a new spot. Castles are my weak spot! I will keep this post and look at your other Japan posts for planning our trip. Fall is a fabulous time to be in Japan, have fun with your planning and if you have any questions just ask, it’s one of our favourite countries to travel in.